This dog breed is amazing, agile, and athletic. They’re also graceful, beautiful, and friendly. But what’s the best dog food for Whippets? What do you feed a dog that can outrun a Kangaroo? Well, we’ve done the research—and here’s what we found out. How Many Calories Does A Whippet Need? Whippets can run faster than a Grizzly bear! But they also have a tendency to be a couch potato. Some say that Whippets have two speeds—35mph, and 0mph! But even though this beautiful and aerodynamic dog breed can tend to be lazy from time to time, it’s still important to feed it like an athlete—and this begins with a quality diet and a sufficient number of calories. An adult Whippet will grow to a height of anywhere from 18 to 22 inches, and will end up weighing somewhere between 29 and 34 pounds. If your dog tends to be less active, then you’ll probably find yourself feeding him/her about 670 calories per day. A moderately active dog of this breed will probably need a bit more—somewhere closer to 850. If your Whippet gets a lot of exercise, runs a lot, takes part in any agility-related sports, or otherwise tends to be highly active, then you’ll probably find that its caloric needs will increase to somewhere around 1,300. Want to Learn More About This Amazing Dog Breed? Check This Out! This video pulled from the Dogs 101 series does an awesome job of describing the Whippet’s amazing capacity for speed, agility, and athleticism. It also does a great job of describing what it takes to care for one. If you own a Whippet, or are thinking about getting one, then I would definitely recommend that you take a look at this video to gain a better appreciation for what these incredible animals are capable of! Whippets are definitely a breed with some basic macronutrient needs—but it’s important to understand that all dogs are also individuals. With that being said, try to evaluate your pet’s diet based on how he or she is doing as an individual. As with any other dogs, Whippets need protein to stay fueled and energized. This protein should come from meat-based sources. If at all possible, try to avoid grain-based dog foods (cheap dog foods at the local supermarket almost always contain too much grain). If possible, feeding grain-free is best for your dog and his/her digestive system. Try to make sure that your dog is getting a variety of ingredients in his/her diet. Does the dog food contain lots of fruits and vegetables? Are there some basic vitamins and minerals added to help support your dog’s development and immune system? Lots of Omega 3 Fatty Acids will help to support your dog’s heart, joints, ligaments, and various other systems—so choosing a dog food that contains a sufficient amount of this vital component will do a lot of good. Wild-caught fish and fish oil are some of the best sources for this essential nutrient. Just remember that there’s no substitute for critical thinking skills when it comes to your dog’s health. If a dog food looks good on the front of the package, make sure to review the ingredients. Keep doing research about your dog’s nutritional needs, and figure out what might be lacking in his or her diet so that you can fill the gaps with nutritious snacks or supplementation. Above all, stay informed—and remember to never stop learning! If you’re looking for some more information on all-around dog nutrition, check out this article on petmd.com. 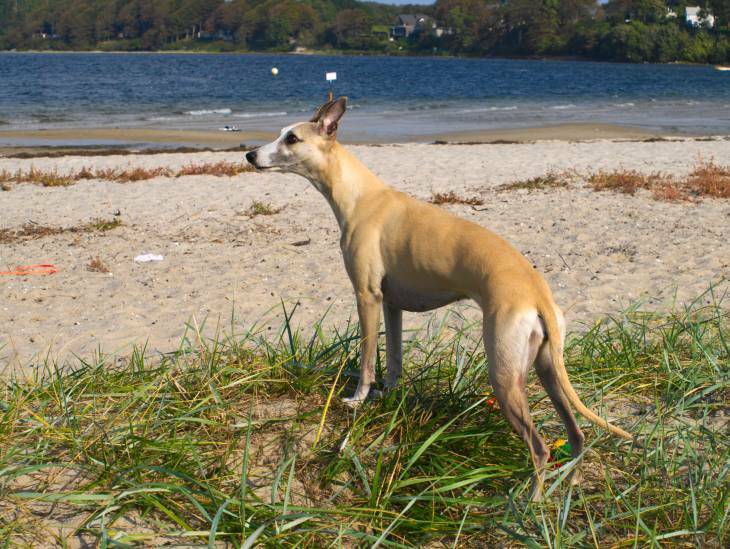 Whippets tend to be pretty healthy animals—though, as is true with any dog, they aren’t immune to their own health problems. Not every Whippet will deal with these problems—but it’s good to be informed, just in case! Here are some of the most common conditions, ailments, and/or diseases that tend to affect this majestic, beautiful, and athletic dog breed. Whippets tend to be sensitive to anesthesia and a few other related drugs—mostly because they tend to have less body fat than other dogs. This isn’t necessarily a disease or a condition—but it is an important factor to consider when seeking medical care for your pet. For best results, try to find a vet that deals with a lot of Whippets or Greyhounds in-general. If you can’t, then make sure to have a discussion with your vet about this issue before getting any procedures done—just to make sure that he or she understands and is aware of the issue. On your end, just make sure you're keeping an eye on your pooch's body weight and feeding her the correct amount of food. Unfortunately, some Whippets end up developing eye problems. Some of these can be ruled out before you buy your Whippet pup by looking at the paperwork from the parents (good breeders will make sure that both parents are tested for common genetic eye diseases before the female is bred), but some of them (like cataracts) are not quite as easy to detect early-on. A diet that’s rich in foods like blueberries, cold water fish, eggs, broccoli, and carrots can do a lot to help prevent vision problems in any dog breed—including Whippets. For more information on foods that can prevent eye problems in canines, take a look at this article on animalwellnessmagazine.com. Believe it or not, Whippets rarely have hearing problems. But for the small percentage that may, a hypoallergenic diet is recommended as a means for doing away with the largest part of the risk for ear problems in any canine breed. Dog foods that contain no grains or sugars are going to be much less likely to cause allergies that could harm your dog’s hearing than foods that contain larger amounts of either of these ingredients. This article contains a lot of quality information on this subject, and I would definitely recommend checking it out if you’re concerned about your dog’s ear-health in any capacity. When it comes to weaning, it’s important to let the mother make the final decision as to exactly when the pups stop feeding—though you can start to supplement her milk with solid food for the puppies at about 4 weeks of age. Whippet puppies will tend to weigh somewhere around 8 pounds by the time they’re 10 weeks old—though their size and rate of growth can vary greatly, depending on their genetic lineage. For a puppy of this size, start out with a diet totaling about 290 calories per day, and then watch and see if it seems to be enough. Some slight adjustment in caloric intake will probably be needed, based on the pups’ exact weight and energy level. 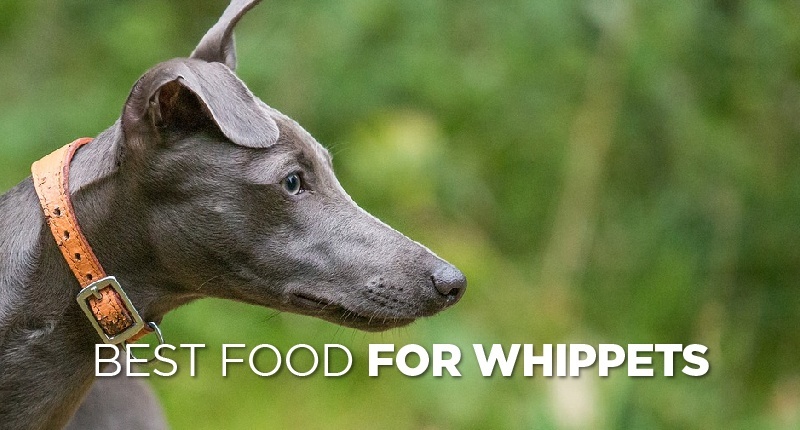 So, What’s The Best Dog Food For Whippets? 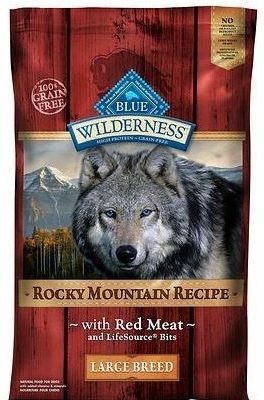 There are a lot of high-quality dog foods out on the market—but in our mind, ​Blue Buffalo Wilderness Rocky Mountain Recipe seems to be one of the best. This dog food is filled with the vitamins, minerals, and amino acids that your dog will need as a basis for a diverse and health-friendly diet. It’s also filled with high-quality, meat-based protein—which is essential for a dog like the Whippet. Since it’s grain free, you won’t have to worry about it being tough on your dog’s digestive system—and it’s filled with Omega 3 Fatty Acids, which are a must-have for Whippets! If you’re in the market for a high-quality, no-nonsense dog food that’ll keep your Whippet strong, healthy, and happy, then I would definitely recommend that you give Blue Buffalo Wilderness Rocky Mountain Recipe a try. It’s loaded with everything that a Whippet needs, and definitely seems to be a step-above the competition.